Good news! Missoula voters approved another Open Space Bond as well as a perpetual stewardship levy to help preserve and maintain our local open space resources for decades to come. We talked TREES at our April 5 monthly meetup - our intern Sydney posted a great recap on our BLOG! ​We're exploring climate-forest-wildfire connections - check out what we're learning on our new page: Forests and Fire. With Trees for Missoula, Missoula Parks and Recreation, and other partners, we're working to expand and develop our urban forest and communicate the climate benefits of our city trees. We helped Trees for Missoula with a planting at Northside Park last October for NeighborWoods month! Work with City's Parks and Recreation Department and Urban Forestry Division, Missoula County, Montana Dept. of Natural Resources and Conservation (DNRC) to identify funding, education, and project opportunities to enhance our urban forest. Use City's Urban Forestry Plan as a starting point. Partner wtih treesformissoula.org, add carbon benefits, and help advertise this site. Consider the creation of a carbon offset program to help finance implementation of a strong Urban Forestry program. Develop and advocate for local and state policy changes which can incentivize urban forests and greenscapes. Work with local government and developers to ensure all socio-economic groups have access to trees and nature. Educate about and incentivize native plantings, bring costs down, and make it easy for community members and businesses. Work closely with the Five Valleys High Performance Building Collaborative (FVHPBC) and Green Building Bucket to tie forest management and sustainable construction together. Specifically expand the use of wood in construction in place of energy intensive materials. Explore use of local woody residuals for right-sized energy projects. Develop a Missoula County Connectivity Project. This would identify restoration needs, promote landscape connectivity to facilitate movement of species, and connect groups and programs with a shared vision. Detailed project scope needs to be defined. Evaluate feasibility of a carbon offset funding program that is more expansive than urban forests. Plan for and use appropriate prescribed fire in roadless and small wilderness areas (e.g. Welcome Creek and Rattlesnake NRA). Include education and outreach. Plan for and use appropriate timber harvest, typically in conjunction with fire, to create resilient forests, emphasizing Wildland Urban Interface (WUI). Develop and advocate for local and state policy changes which can support or incentivize xeriscaping. Develop Forest and Water "Best Management Practices" that will blend the desire for water quality with increased water yield and timing. Encourage agencies to remove and/or replace under-sized culverts that make roads vulnerable to "rain on snow" or other flood events. Conduct forest activities that enhance forest resilience and provide water yield benefits. Educate about value of open forest/open space, building support to preserve and expand. Partner with local, state and federal governments and non-government organizations to offer education to private landowners about wildfires, fire use, and dynamic nature of ecosystems. Showcase research conducted by Missoula Fire Sciences Laboratory (Fire Lab). Educate and support sustainable forestry that builds resilient habitats and watersheds, with priority in the Wildland-Urban Interface (WUI). Our friend Dave Atkins has started a new blog all about FORESTS, with a special section on Trees and Climate. Our friends at Trees for Missoula do great work and have some excellent resources about tree planting. Check out our Blog﻿﻿﻿ all about Urban Forests and with a map of tree canopy by neighborhood. Pretty cool. We have a 2016 report, based on earlier work with the City of Missoula: Climate Change and Missoula's Urban Forest: a tree canopy assessment. Local study finds that 13.4 % of Missoula is covered by urban forests. 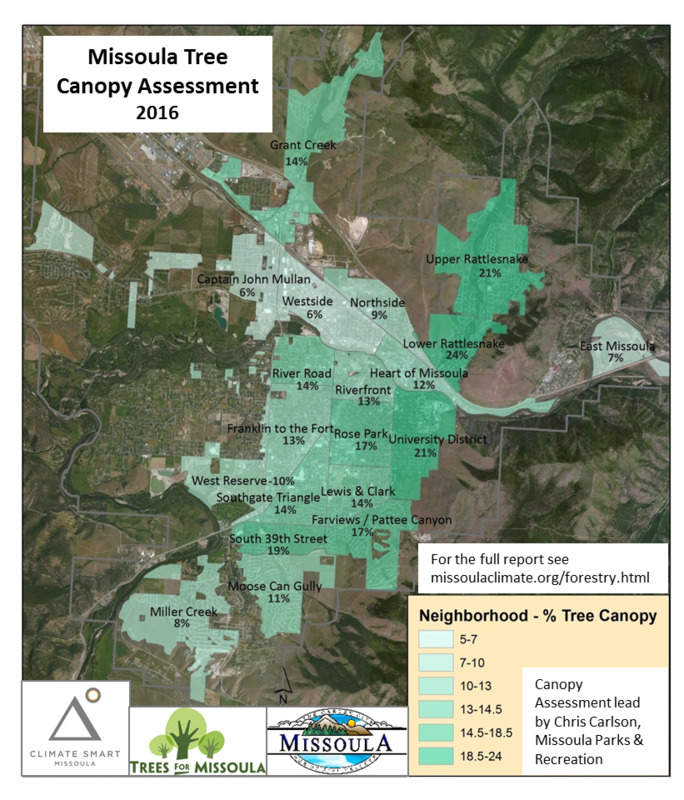 A collaborative group that includes Climate Smart Missoula, Missoula Parks and Recreation, the US Forest Service, and Trees for Missoula, worked on a study to map and evaluate our urban canopy cover, to learn which neighborhoods have more - or fewer - trees. Check out our infographic below! Check out this report on Missoula's urban forests and climate change! ​"In all, the students marked 28 different trees around campus with the neon green tags that show their economic benefit to the school. Those trees alone totaled more than $200,000 in value over a 50-year period." "Sixty one percent of all trees lining the streets of Missoula could be removed over the next 20 years, according to an urban forest plan presented to the Missoula City Council in April 2015. That's a total of 14,884 trees. The council approved $120,000 to fund the project through its first fiscal year." Trees are one of the best dollar-for-dollar investments a city can make. Read about it here! Another win for cities with trees - from Minneapolis to Bangladesh! Money may not grow on trees, but the benefits trees provide are worth a lot! Interesting article about trees and heat islands from the east coast. Urban forests also provide major mental health benefits. Check out this video on the benefits of urban forests! How are other cities managing their urban forests? Check out the "10 Best Cities for Urban Forest," according to American Forests. Ready to plant a tree? Check out the City of Missoula's recommended trees and shrubs for this community, which includes tips for planting and watering, and a ﻿list﻿ of certified arborists.